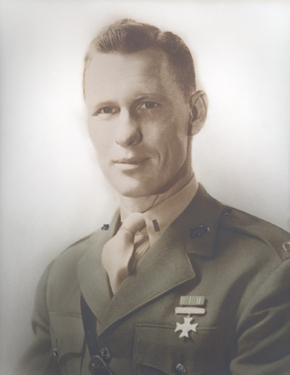 "For conspicuous gallantry and intrepidity at the risk of his life above and beyond the call of duty as Leader of a Rifle Platoon attached to the Second Battalion, Twenty-seventh Marines, FIFTH Marine Division, in action against enemy Japanese forces on Iwo Jima in the Volcano Islands, 8 March 1945. Resuming his assault tactics with bold decision after fighting without respite for two days and nights, First Lieutenant Lummus slowly advanced his platoon against an enemy deeply entrenched in a network of mutually supporting positions. Suddenly halted by a terrific concentration of hostile fire, he unhesitatingly moved forward of his front lines in an effort to neutralize the Japanese position. Although knocked to the ground when an enemy grenade exploded close by, he immediately recovered himself and, again moving forward despite the intensified barrage, quickly located, attacked and destroyed the occupied emplacement. Instantly taken under fire by the garrison of a supporting pillbox and further assailed by the slashing fury of hostile rifle fire, he fell under the impact of a second enemy grenade but, courageously disregarding painful shoulder wounds, staunchly continued his heroic one-man assault and charged the second pillbox, annihilating all the occupants. Subsequently returning to his platoon position, he fearlessly traversed his lines under fire, encouraging his men to advance and directing the fire of supporting tanks against other stubbornly holding Japanese emplacements. Held up again by a devastating barrage, he again moved into the open, rushed a third heavily fortified installation and killed the defending troops. Determined to crush all resistance, he led his men indomitably, personally attacking foxholes and spider traps with his carbine and systematically reducing the fanatic opposition, until, stepping on a land mine, he sustained fatal wounds. By his outstanding valor, skilled tactics and tenacious perseverance in the face of overwhelming odds, First Lieutenant Lummus had inspired his stouthearted Marines to continue the relentless drive northward, thereby contributing materially to the success of his regimental mission. His dauntless leadership and unwavering devotion to duty throughout sustain and enhance the highest traditions of the United States Naval Service. He gallantly gave his life in the service of his country." © 1999-2007 Utility Press Inc. All rights reserved. Copyright claim exclusive of Citation.